I know two things: Máire Claremont is the great-great-great-great-great grandchild of Emily Bronte, who I realize was never married, but in romantic literature, easy to circumvent, and Máire Claremont is romantic. Talk about an author who believes in love conquering all, including but not limited to opium addiction. She must be. Her writing is so beautiful and lyrical, only a Bronte could have written it, right? I am convinced. 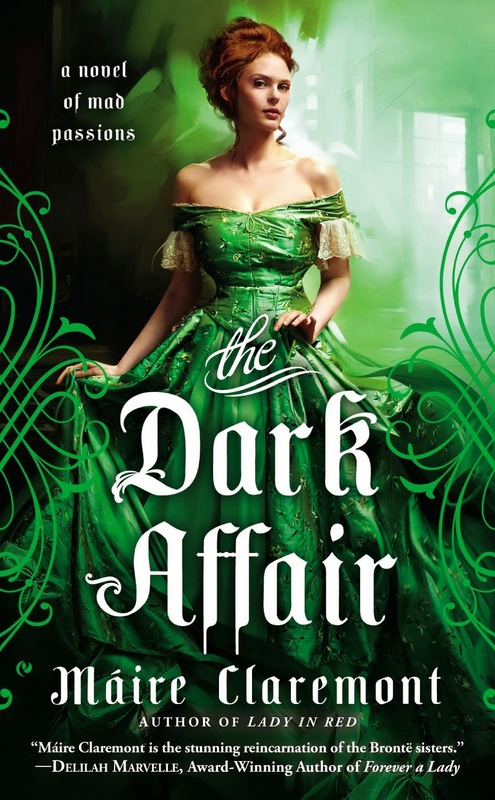 The setting of The Dark Affair, much like its predecessors, is wonderfully Victorian goth, dark and gloomy, with grim settings in asylums and harsh treatments and constant near threat of being locked away forever if you act out of line. You know how some romantic novels make you think you could go back in time and live in that setting with no worry? Not in a Máire Claremont setting. It’s cold. It’s stark. Many times it’s loveless. It’s desperate and it’s always, always on the edge of falling into something worse. But you don’t mind because the dialogue is so beautiful and authentic, you feel you’re watching a BBC drama that makes Downton Abbey look anachronistic and fluffy. How can you not root for these characters? The Irish Catholic heroine who is so poor she only wishes she had two half-pennies to rub together and the mad viscount addicted to opium and grieving for his dead wife and daughter. The heroine is known for her ability to help addicts—a stretch historically, perhaps, but brilliant anyway—and the viscount’s father contacts her to help his son, who has been locked into an asylum. You know, BY the father. You couldn’t pair a more unlikely duo. The heroine, Margaret Cassidy, has a bit of a savior complex. She’s got the family that falls apart; and she at such a young age is left to pick up the pieces and hold everything together. That’s what she does, all day long, holds it together. The viscount’s father—who you may have guessed can be a bit heartless—wants Margaret to marry his son, as protection if/when the father dies to help keep his son out of the asylum. She does not immediately embrace this clause, but a few ghosts from her past—namely a dear brother who is trying to join up with the Fenians—encourage her to accept this proposal in order to save her family. The hero, Viscount Powers, definitely has the tragic, romantic hero down pat. He doesn’t really care if he lives or dies, and he’s really leaning toward the latter, though he’s not so mad as to throw himself in front of a carriage of horses or anything. He spends most of his time trying to numb the pain of his loss with laudanum, which ends up making him do some crazy things, and ended up getting him tossed into the asylum. He’s so addicted that the only way to control him is to tie him to the bed and then shoot him with morphine, which happens to be another form of opium. Don’t you love the Victorian age? Combating fire with fire? With doctors like these, who needs a flu epidemic, am I right? Once Viscount Powers is taken back home, Margaret goes through the unenviable process of detoxing him, all the while getting helpful asides from his father that says, “I want him to act normal. If he starts acting crazy, I’ll know I should never have asked a woman to help and I’ll get rid of you and hire male doctors instead.” He’s a keeper. Normally Margaret would suggest gradual detoxification, but heroes are heroes, and they always go cold turkey or else. You feel you’re getting detoxed right along side him; and you’re tempted to tell your own doctors to never prescribe any codeine, just in case. It’s just not worth it. Through some trial and error, and a Black Moment where you wonder if the hero will succumb again to his past addictions, love finally does conquer all; and Máire does do her best to tie up a grim gothic book by showing us how Powers and Margaret keep their Happy For Now ending going by a sort of Addict’s Anonymous type of counseling and day-by-day approach. You know the hero doesn’t slip, but she is clear that the struggle is still there, as any true addiction would be. Kudos to Ms. Claremont for tackling such gritty, tough subjects like addiction, mental health, and health care in the Victorian age. Those topics would be a hard-sell most of the time anyway, but she does make the characters, while flawed, very likable and worthy of our sympathy. I also do have an interest and curiosity about asylums and all the other grim topics that go with such a place, so I found the topic quite diverting from the typical historical romance which is more romp than reality. However, right in the middle of me reading this book, Phillip Seymour Hoffman died, which is no fault whatsoever of Ms. Claremont, but is living proof that the reality is much more than a romantic story where love always triumphs. You never really cure addiction; you just live with it, much like you would with any mental illness. So while I admired Máire’s epilogue that alludes to the fact that Powers continued to go to his “meetings”, continued to struggle, but also continued to overcome with the help of loved ones who supported him, at the same time, it felt a bit rushed and a little too neat. Still, how can you not root for that kind of story? If you liked the story of Walk the Line, about Johnny and June Carter Cash, I would say this falls into similar territory, at least the hero struggles constantly with addiction, his relationship with his father, and trying to be the man he knows he should be, could be. It is one of my favorite movies and I’ve watched it many times. I read The Dark Affair with the same sort of intensity, wondering how it would all work out, but it surely would. However, in Walk the Line, we all know that movie cut off at a point where Johnny Cash conquered his addiction for a time but later struggled with reconquering it over and over again, with the love and help of one woman. Four stars. Although this book has setting, voice, intensity, and character to an art form, and you will likely be as immersed as I was in the gothic world, I am deducting a point because curing his addiction and him managing to avoid a relapse seemed a bit too “easy” and took me out of the story as I questioned if that could be remotely possible. Sure, an English lord willingly marrying an Irish Catholic? No big deal. But detoxing and side-stepping a relapse with the kind of surety of one avoiding only one pothole in a road? Now we’re stretching credibility for me. I am tempted to read the previous books now—the voice is quite engaging—and I think Máire Claremont certainly fills a void for those of us missing the grittier, darker, more passionate kinds of stories. I will definitely look for her next book. While Maire's novels may be a bit dark, I find that she also imparts lots of information on addiction and lessons to be learned from it. I have not read her new novel yet, but certainly plan to. I found the book very enjoyable! And yes, I do agree that Maire does impart a lot of knowledge and research about the topic (without being overdone, obviously!). I just think it needed to be longer! WOW this excerpt is great the book sounds like a winner to me. It was very intense and engaging! I hope you like it!! Maire's attention to detail with the time period is very rewarding to read! Hellie, this reminds me of a play I once took a girl friend to watch. while still students. It was 'House of the Dead' by Dostoevsky which had great reviews from the art critics. Half way through the first act my friend stood up and in a loud voice declared "I can't watch this rubbish any more. I want to be entertained". She then marched out, with me struggling to follow and making sympathetic noises. Prison camps in Siberia are a barrel of laughs! I think that some of Catherine Cookson's novels also deal with the more depressing aspects of Victorian society. *LOL* I understand, Q! And I totally understand valuing books where they deal with the lighter aspects of a period. (Hence why we never have romance novels in Victorian settings where everyone is poor. SURE, they fell in love too, but it's really hard to embrace that Happily Ever After and we want them to be rewarded.) When books tend to take on grittier topics, it does run a finer line of the Happily Ever After, I think; it's a lot easier to believe in HEA when people aren't "broken" or come with problems--but I will argue it is nice to read a book about read people and real themes, even set in a historical period--after all, there is truth that they did survive and thrive for us to be here today! Let's just hope some of them were madly in love while they did it! I like variety and edgy and dark are a nice change of pace so for me this sounds like an author I need to give a try - thanks for the review! Catslady, it sounds like we value the same things: variety, edgy and dark. *LOL* Definitely give her a whirl. Sharlene below advocates for reading the book before it to give some perspective and clarity--and I think that is probably sound advice. As for the voice of the author and the authenticity of the world and setting, I wholeheartedly recommend Maire Claremont. I don't think it was easy. I had read Lady In Red shortly before reading The Dark Affair, so I saw Powers in that one, already struggling with the addiction, and to me it seems he was trying to fight it at that time. I found both of these books to have an underlying message of hope, right from the beginning, with characters that were obviously good at heart. I never felt totally hopeless for them, because the love was there. I agree, Sharlene. That might have helped. And I'm not trying to scare people off either, I'm really not. I will also throw in the disclaimer that I'm suffering Winter Blues (so darker reads are even darker to me right now), the Philip Hoffman thing, and just stress in general may have contributed to my less than raving response. I do believe it was a very good book; just for me, I needed a bit more to believe the hero was going to be all right. Perhaps seeing him in an alternate setting trying to overcome would have been the push needed. Or maybe I needed to read this in the summer when I had seen the sun a few more days and soaked in some vitamin D. This book is very intense. I think readers need to be braced for that--if they're looking for light and fluffy, this is not the book; however, it is a very worthy, very well-written book if you're in the mood for something different and grittier. :) Thanks for reading! LOL! I need some sun, too! The longest winter in history! Thanks, Hellie! I've heard good things about Claremont's writing. I enjoy a variety of books. Sometimes I want light and fluffy but, at other times, I enjoy a dark and intense story. Next time I'm in that mood, I'll definitely check out this book. She definitely has an engaging voice, at least for me. :) But I think that's a pretty common consensus across the board too--her Voice is great; and her storytelling, setting are very much her strengths. I go through moods of what I want to read too: light and fluffy; contemporary; historical; dark, gritty, intense... I'm glad there are books for every mood. One of the best things about Romance, no? Most definitely, Hellie. Something for every reader and every reader's mood. Thank you for the review. I had not heard of this author, so thank you for letting us know about her. I enjoy something a bit less sweet in a story. I have a stash of old gothic romances (I guess) from the 1960s and 1970s. Every once in a while I pull one out to read. Some of them are a bit far out there. This one sounds like it is closer to "reality" which makes it all the more frightening. I will be checking out this and her other books. I love the cover. Gives it a touch that lets you know this is not the usual Victorian or Regency romance. Exactly! The tone of the work (and she writes beautifully--the kind of writing you just like to read, you know?) harkens back to the older gothic novels we all used to love. However, she has couched it in a reality of the time: addiction, opium availability and acceptance of use in medicines (et al), and social structure and expectations (i.e. you could be thrown into an asylum on a whim if you were a woman in those days!) --so it all feels very frightening and real, and yet you see characters thriving as you know they did. Let us know if you like her books!